The devices developed in the lab of Rice chemist James Tour are geared toward electronics and apparel. They are the subject of a new paper in the journal Advanced Materials. Rice's microsupercapacitors charge 50 times faster than batteries, discharge more slowly than traditional capacitors and match commercial supercapacitors for both the amount of energy stored and power delivered. 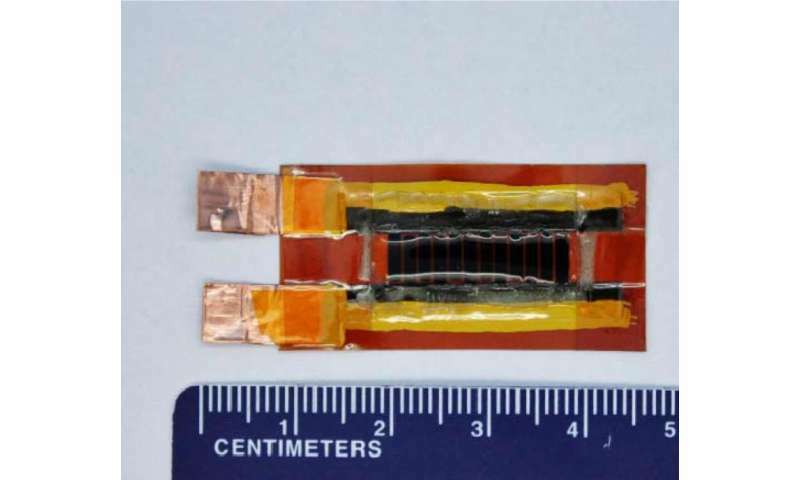 "It's a pain in the neck to build microsupercapacitors now," Tour said. "They require a lot of lithographic steps. But these we can make in minutes: We burn the patterns, add electrolyte and cover them." 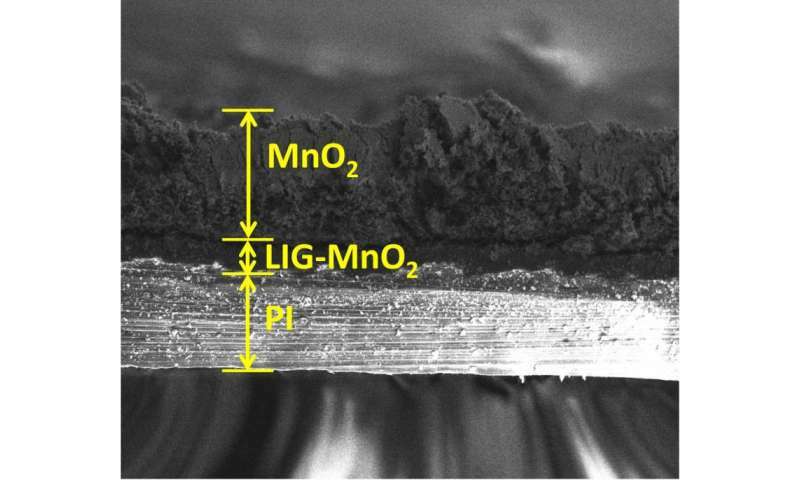 The researchers treated their LIG patterns—interdigitated like folded hands—with manganese dioxide, ferric oxyhydroxide or polyaniline through electrodeposition and turned the resulting composites into positive and negative electrodes. The composites could then be formed into solid-state microsupercapacitors with no need for current collectors, binders or separators. Tour is convinced the day is coming when supercapacitors replace batteries entirely, as energy storage systems will charge in minutes rather than hours. "We're not quite there yet, but we're getting closer all the time," he said. "In the interim, they're able to supplement batteries with high power. What we have now is as good as some commercial supercapacitors. And they're just plastic." BLa bla bla, bla bla bla and the copy paste the numbers wrong, super write-up! ENERGY DENSITY confused with POWER DENSITY (3.2 milliwatts per cubic centimeter is power density), then it should be at least 2 orders of magnitude higher (probably confuses cubic centimeter with cubic milimeter), this way the energy density is probably lower then if I make a battery with some coins and my saliva. WONDERFUL NEWS! Pseudo/MicroCapacitors Displacing even the SuperCapacitors. Working in this realm of physics, one always explained the concept of a capacitor that could charge within minutes, and discharge slowly. Working with motors, wires and magnetic fields, one would have to create a capacitor that can charge within the same limitations as, filling a gas tank, and expending the collective power to propel a carrier approximately 300 miles.